Happy Halloween! Best excuse to wear excessive make up and eat unhealthy amounts of candy with minimal judgement. Her dress is from Forever 21 and the ear cuff is from OKA Jewelry. Even though the cuff has an elephant on it, I still think it goes well with the overall mouse theme. What I love most about the ear cuff is that it’s not just costume jewelry. It’s very simple and dainty, and perfect for any fall outfit. It’s easy to wear, and it’s a nice accessory to have in your collection. This will be a brief, little post. 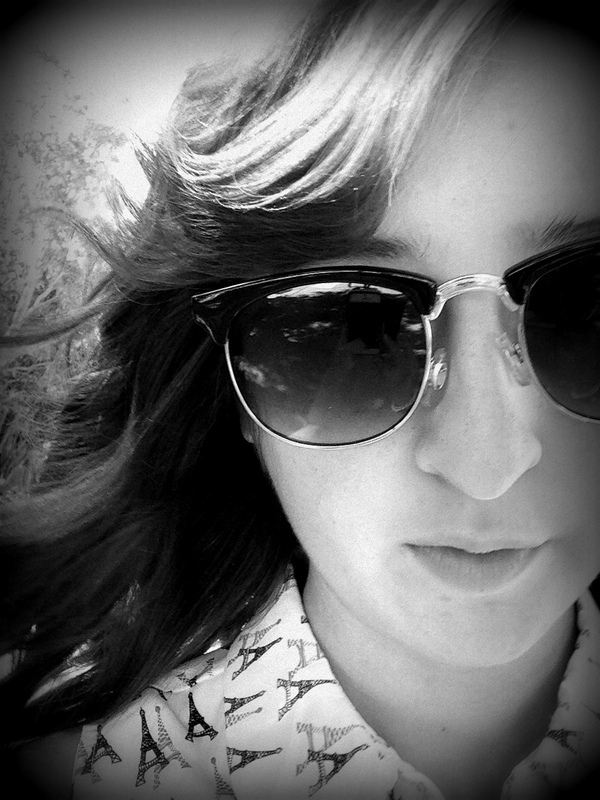 I just wanted to put out all the ways to follow my fashion blog, claireleighton. TGIF. If you’re not spending your weekend cooped up in various study boxes crying over how many midterms you have, this is the perfect outfit for a night out! On top I am wearing an asymmetrical top that can be worn several ways – essentially its just a circle of cloth with arm holes that can be draped over your torso however which way. This item was thrifted. On bottom I am wearing a short black pencil skirt by Bloom, and flats by HotCakes. The main statement of this outfit is, of course, the gold necklace and bracelet set! These were sent to me from OKA Jewelry, and I can’t say I’ve every owned anything like it! It’s out of my comfort zone, but once I experimented with it, I saw many wardrobe combination possibilities. So this is what I came up with! I think that the gold goes very nicely with dark navy. I feel like this jewelry will also go great with the “little black dress.” Another possibility would be to wear this jewelry for Halloween! OKA Jewelry also sells a great deal of costume jewelry for fun occasions. I imagine the necklace would go well with an Egyptian-styled costume. Hope this is of inspiration for a fancy Friday. 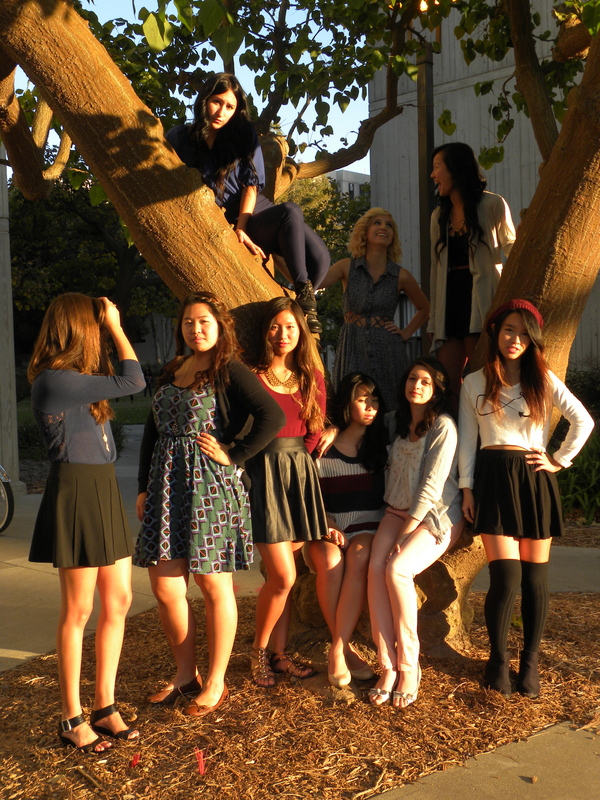 We call ourselves the Twerk Team Sorority. The theme for this photo shoot is Girls Night Out. First up we have Palak sporting light pastels for an overall casual, yet cutesy look. The grey wedge heels make this look appropriate for a nice dinner out at let’s say… BJ’s! Next we have Maxine, pulling off my dream outfit. Here we have all the fall essentials displayed at once: the black circle skirt, a beret/beanie, stockings, black boots, and a long sleeve crop top. Black and maroon are worn best during the fall. Again with black and maroon, we have Christina also sporting a black circle skirt (I’m telling you – a must have). Circle skirts are best worn with either a cropped top or by tucking the top into the skirt. Next we have Alyssa wearing all dark navy blue – another great color for fall if you’re not into the whole maroon palette. I remember when tucking in shirts was regarded as dorky, but now it is very fashionable with the styles they are coming out with today. If you live in SoCal, it’s still pretty warm here. No need for heavy coats or many layers. 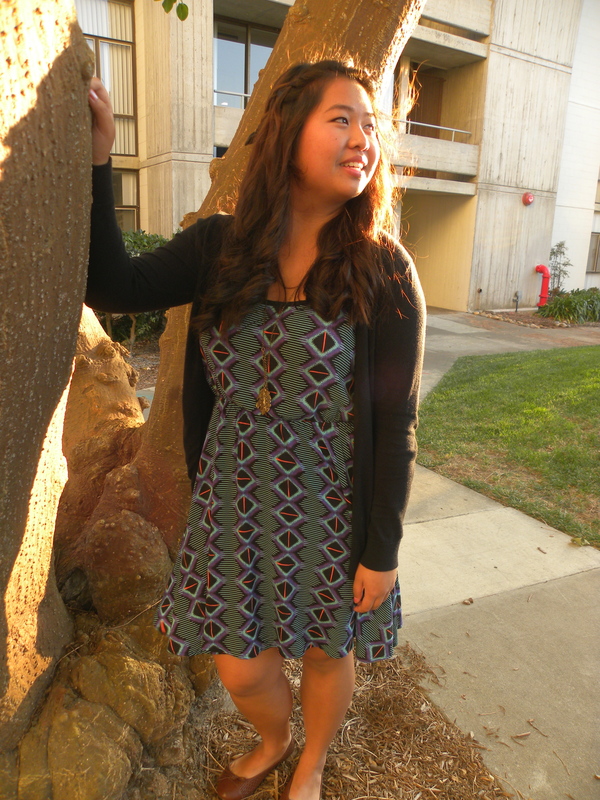 Here we have Rebecca wearing a patterned dress suitable for most any season, but toned down by a black cardigan. Let’s take a moment to appreciate the craftsmanship of this waterfall braid (done by Waing, bow added by Cindy). 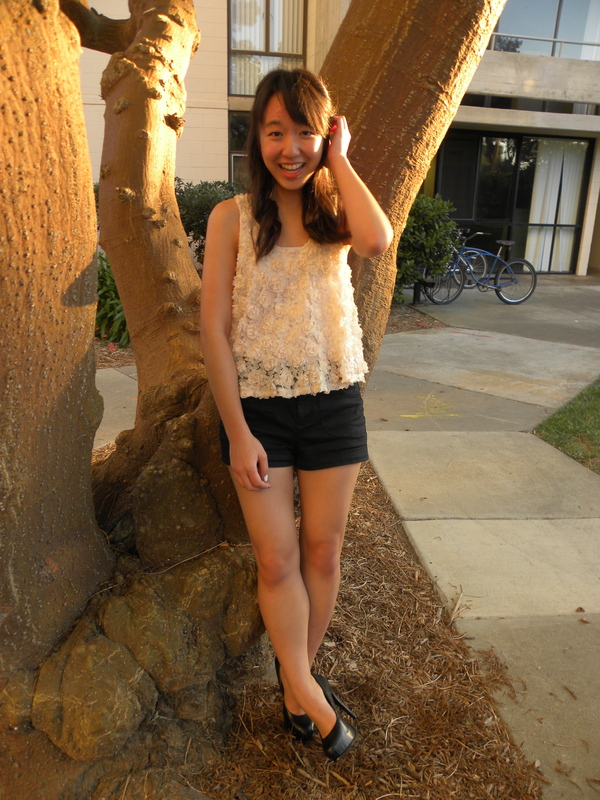 Next we have Cindy, looking cute as ever in a beautiful flowered top from Forever 21. You can never go wrong with neutrals and black pumps – stay classy. And now we have Waing, pulling off a black laced romper (I am so jealous). Like I said, it’s still pretty warm in SoCal, but as long as you stay with dark colors, you can still incorporate summer clothes into your fall closet. Here is yet another example of combining summer wear with fall wear. 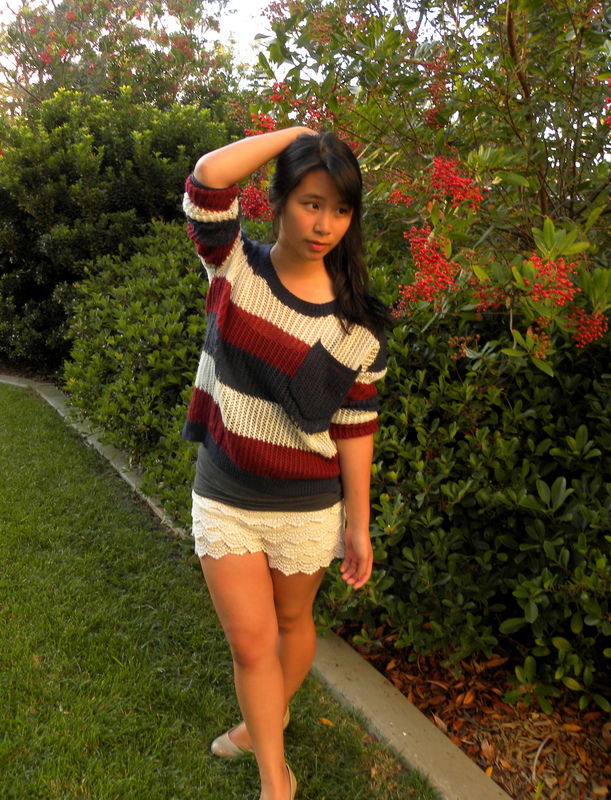 Here is Christina pairing white lace shorts with a warm-toned sweater and neutral flats. She is not usually this serious. And now for Natalie (who I think looks likes Anna Kendrick). She looks absolutely adorable in this 50’s themed blue dress with cutouts, and curled ringlets. Is that the black circle skirt you’ve been blogging about in every single post lately, you ask? Yes, yes it is. You must wear it every single day! I do. Phew that was a long post. Surely that counts for an entire month of blogging! I hope you enjoyed. Comment down below which outfit is your favorite! Here is a little inspiration for a fall nail polish look. My roommate can create manicure-status nails, and she loves polka dots. So here is the final product! (The trick to making polka dots is by dabbing a bobby pin in the nail polish). Tomorrow: Suite fashion shoot! Stay tuned for plenty of college-style looks! Ever since I came to college, I have worn this skirt most every day. I suppose that’s an exaggeration, but I just can’t stop wearing it. 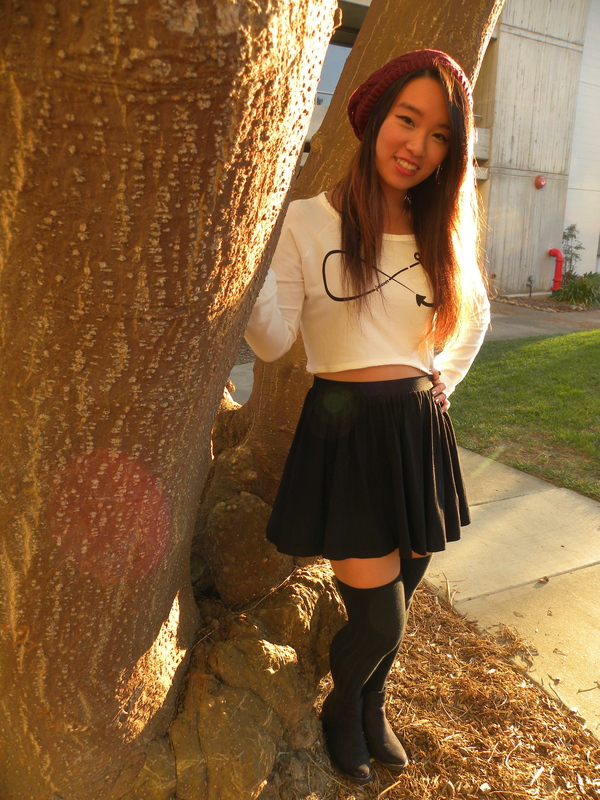 So here is yet another OOTD with me wearing the infamous black circle skirt. 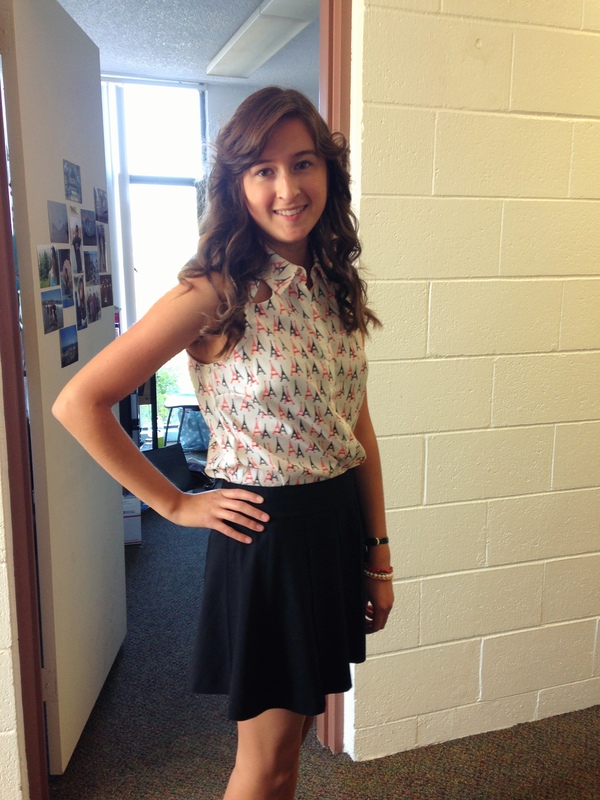 Also, my awesome suite mate curled my hair for me (since I have difficulties understanding hair styling technique). On top of that, I wore a pair of sunglasses my volunteer group found in the sand during our beach clean-up. They are a bit crooked, but overall in pretty good shape. I like their vintage style. 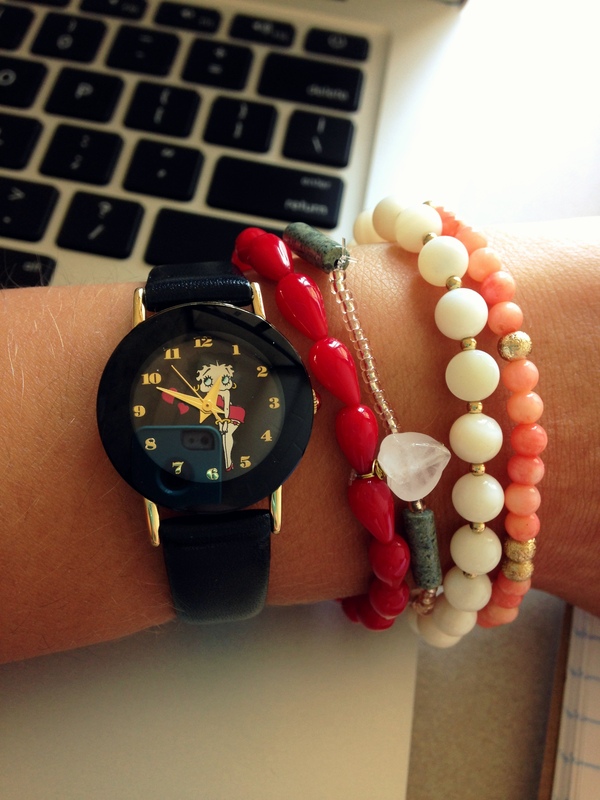 And finally, the accessories: a Betty Boop watch with the stackable bracelets from OKA Jewelry. Coming up: This Friday (hopefully), I will be having a photo shoot with my suite mates. Which means lots and lots of outfits, in one day! That should make up for my relative lack of presence on WordPress lately. Being at college for the past couple of weeks has opened me up to something greater than small town fashion. Being in a greatly populated area has challenged me to play around with my style; I see so many people on the daily wearing clothing combinations I never thought of trying. So here is my take on college fashion.